(4634, W. P. Campbell Collection, OHS). Born on December 10, 1870, near Embry, Mississippi, to Thomas M. and Caroline Elizabeth Wingo Gore, U.S. Sen. Thomas P. Gore lost the sight of both eyes in two separate accidents as a young boy. Even as a teenager he was an outstanding orator and became active in politics before he could vote. He graduated from the normal school at Walthall, Mississippi, in 1890 and taught school before attending law school at Cumberland University in Tennessee, graduating in 1892 and being admitted to the Tennessee bar. In 1900 he married Nina Kay, who was thereafter to function as his "eyes." 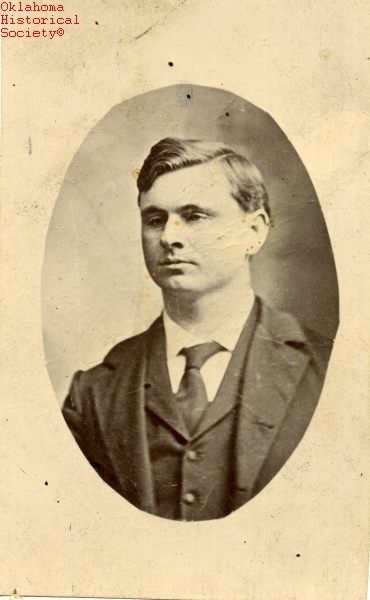 After joining the national Populist movement, Gore moved to Corsicana, Texas, to practice law in 1894. In 1895, returning to Mississippi, he was an unsuccessful Populist candidate for Congress in 1898. With the defeat of William Jennings Bryan as the Populist presidential nominee in 1896, the party began to decline, and soon Gore became a Democrat. In 1901 Gore moved to Lawton, Oklahoma, and he continued to practice law. In 1903 he was elected to the Oklahoma Territorial Council. A renowned orator even from youth, he frequently offered elegant and quotable comments such as, "I would rather be a humble private in the ranks of those who struggle for justice and equality than to be a minion of plutocracy, though adorned with purple and gold." He served in the council until 1905. When Oklahoma was admitted as the forty-sixth state in 1907, he was elected one of Oklahoma's first two U.S. senators. His actions bespeaking those of a Progressive Democrat, he was reelected in 1908. As a former Populist, he easily represented the interests of farmers, who opposed railroad monopolies and high rates and demanded railroad regulation. Using his oratorial skill, he advanced the cause of Democratic presidential nominee Woodrow Wilson in 1912. Becoming Wilson's trusted personal ally, he served on the Democratic National Committee from 1912 to 1916, assisting the president in a sweeping reorganization of the party. Gore turned down offers for a presidential cabinet position to keep his U.S. Senate seat from Oklahoma, a post to which he was reelected in 1914. The 1914 Oklahoma senatorial campaign was one of the dirtiest in American history. Gore's enemies set a trap for the blind senator. A woman named Minnie Bond lured him to her hotel room under the guise of speaking with him about an appointment for her husband. After a staged rendezvous, the woman claimed he had taken advantage of her. Prosecutors refused to file criminal charges, but Bond lodged a fifty-thousand-dollar civil lawsuit against Gore, who was defended by legendary Oklahoma lawyer Moman Pruiett. Pruiett labeled the proceeding, which captured headlines across the nation, a "political trial." The jury unanimously voted to exonerate the senator. Gore often voted in support of President Wilson's New Freedom legislation, including the establishment of the Federal Reserve System, the Federal Trade Commission, and woman suffrage. In the spring of 1913 Gore was appointed to his most cherished position in the Senate, chair of the Committee on Agriculture and Forestry. He also served on the Senate Finance Committee, the Committee on Railroads, the Committee on Expenditures in the Department of Justice, and the U.S. Commission to Investigate and Study Rural Credits and Agricultural Cooperative Organizations in European Countries. The study resulted in legislation that established a system of privately controlled land banks to operate under federal charter. Gore was an isolationist. He opposed American involvement in World War I, primarily because he believed that tax money should be spent only on agricultural programs, rather than armies and munitions. He became anti-administration on most war legislation and evoked the ire of many Oklahoma newspapers and voters. One newspaper called him "the Kaiser's right hand in America." Another paper demanded that he represent the pro-war stance of a majority of Oklahomans or resign. His antiwar stance also cost him his close personal friendship with President Wilson. Gore was unrelenting in his opposition to the war, opposing a draft to fill the ranks of the army and voting against the selective service act. Once the United States entered the war, however, he fully supported the effort. Nevertheless, even after the successful conclusion of the war, he did not change his stubborn isolationism. He believed America had been duped into entering the conflict, and he often quoted George Washington's advice to avoid entangling alliances. The war over, Gore's previous isolationist stands remained in the minds of the electorate. He was defeated in his reelection bid in 1920, largely because of his antiwar sentiments and his opposition to the popular President Wilson's plan for the League of Nations. After his defeat Gore practiced law in Washington, D.C. Running again for the Senate in 1930, he tied his campaign to the "cheese and crackers" campaign of Gov. William H. "Alfalfa Bill" Murray and was reelected. Back in the Senate, Gore criticized Republican Pres. Herbert Hoover's recovery policies during the Great Depression. He campaigned for successful Democratic presidential nominee Franklin D. Roosevelt in 1932 but soon became an outspoken opponent of the new president's recovery programs as well. The fiscally conservative senator vehemently opposed federal control of industry and relief efforts, believing instead that state and local leaders should guide the efforts to recover from the depression. He voted against the National Industrial Recovery Act, abstained from voting on the Agricultural Adjustment Act, and vocally opposed public welfare legislation. Most leaders wanted New Deal programs for Oklahoma and its cities and towns. When Gore threatened to vote against the Roosevelt legislation, he was again attacked in newspaper editorials and was barraged by letters from Oklahomans hurt by the economic downturn. Citizens booed him at political campaign rallies. Accused of being too conservative to support Roosevelt's relief efforts, Gore lost in his reelection campaign in 1936. Some thought he was out of step with the times, and he was removed from the political scene. He practiced law in Washington, D.C., until his death on March 16, 1949. His grandson is historian and author Gore Vidal. Thomas P. Gore's most important contributions were his staunch support of the oil industry, soil conservation, and American Indian tribal issues. But he may be best remembered for his glowing tribute of his adopted state. He said, "I love Oklahoma. I love every blade of her grass. I love every grain of her sands. I am proud of her past and I am confident of her future. The virtues that made us great in the past can keep us great in the future. We must march, and not merely mark time." Monroe L. Billington, "Senator Thomas P. Gore," The Chronicles of Oklahoma 35 (Fall 1957). Monroe L. Billington, Thomas P. Gore: Blind Senator from Oklahoma (Lawrence: University of Kansas Press, 1967). Robert Henry and Bob Burke, Thomas P. Gore: A Clearer Vision (Edmond: University of Central Oklahoma Press, 2002). Paul D. Travis, "Gore, Bristow, and Taft: Reflections on Canadian Reciprocity, 1911," The Chronicles of Oklahoma 53 (Summer 1975). Bob Burke, "Gore, Thomas Pryor," The Encyclopedia of Oklahoma History and Culture, https://www.okhistory.org/publications/enc/entry.php?entry=GO013.